This is a weekend which won’t see any blockbuster ties. Perhaps the biggest match of the weekend is Uganda v Tanzania, the East African derby. That isn’t a match because of the standing of the two sides – it’s the verbal sparring in the lead up to the match that has fuelled some adrenaline. That said, there are some banana skin ties with some giants on the road in unfamiliar territory which will enviably throw up atrocious pitches and a local climate favouring the team. Algeria are away to Gambia under new coach Djamel Belmadi; Ghana are in Kenya; DR Congo in Liberia; Senegal in Madagascar; Cameroon in Comoros; Tunisia in Swaziland; Nigeria in Seychelles; and Mali in South Sudan. If anything, this weekend will give us some insight about how some of the minnows in the continent are developing. Has Emmanuel Amunike shot himself in the foot? New Tanzania coach Emmanuel Amunike wielded the axe on seven players after they arrived late to the national team camp. Simba’s John Bocco, Jonas Mkude, Shiza Kichuya, Shomari Kapombe, the red-hot attacking midfielder Hassan ‘HD’ Dilunga and Erasto Nyoni, as well as Yanga’s talented midfielder Feisal ‘Toto’ Salum, miss out and were replaced by seven others. It was a brave move by Amenike, where a slap on the risk may have been a better option, and he hasn’t had a U-turn despite the public outcry and negotiations with the Simba hierarchy. Captain Mbwana Samatta sidestepped the question during Thursday’s press conference, stating he’s in charge of leading the team rather than selecting it. Despite his reluctance the answer the question directly it dominated the press conference. Tanzania’s abysmal record on the road means the fixture has been made harder by the omissions. With three of the seven likely starters, and all seven likely to be Tanzania national team squad regulars, Amunike’s call could come to define him as Tanzania coach. 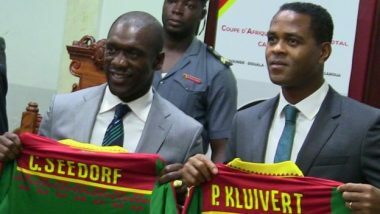 While the Cameroon job has seemingly been a constant rebuilding one in the last few years, the Seedorf and Kluivert come into a good, challenging situation. Their challenge is simply to steer a unremarkable side to defend the Africa Cup of Nations crown next year when they host it. They have not arrived quietly. They have shown their authority early on by announcing they will be ignoring any players that play their football in China, triggering a mixed reaction. In doing so Benjamin Moukandjo and Christian Bassogog have missed out for the Comoros game. The former has been one of Cameroon’s best players in recent years and the latter was the player of the tournament when Cameroon won AFCON last year. There is a suspicion that Seedorf has shown a lack of understanding about the African game, about the African kid on the street that yearns to play football abroad, primarily for the betterment of himself and his family, by stating that “good young players don’t compete in China or Asia”. Seedorf has been described in the past as talking like a cabinet minister, and on this issue, he may just have shown how out of touch he is. New Egypt coach Javier Aguirre has brought in his own backroom staff, and he will also look to bring a more entertaining style of football with him when Egypt face Niger. Former Spain and Real Madrid full-back Michel Salgado is part of the coaching staff and if he is as good at coaching as he is at punditry then Egypt will do very well indeed. The relationship between Aguirre’s predecessor Hector Cuper and the Egypt public had a spectacular high – World Cup qualification for the first time in a while – but it had always been uneasy, with the brand of football never truly convincing the fans. In the end, the ends didn’t quite justify the means and a poor World Cup saw an impasse. Will Aguirre release the shackles and are Egypt well-equipped to play without them? Cuper had a set template which he stubbornly stuck to, but Aguirre’s task will be to trust a more talented crop of Egypt players to push the limits.